Visit the professionals at Distinctive Glass for all of your window tinting needs! Custom window film installation in the greater Indianapolis area. Stay cool and comfortable at home, at work or on the road with window film professionally installed by Distinctive Glass in the greater Indianapolis area.As your local SelectPro dealer for industry-leading LLumar window tint, Distinctive Glass offers high-quality, energy-efficient and affordable solar control solutions. Our full lineup of residential, commercial and automotive window films block out the dangerous UV rays that can quickly heat up your building or car and send your energy bills skyrocketing. Here in the greater Indianapolis area, more than one-third of a home’s energy costs are lost through windows that aren’t energy efficient. Old and dilapidated windows let your air conditioning escape outside during the summer and let the cold come inside during the winter. Instead of replacing your windows, treat them with cost-effective Vista by LLumar residential window tint from Distinctive Glass. Our home window film helps maintain consistent temperatures throughout your home year-round, increasing your comfort and reducing your energy bills by up to 15%! Reduces solar heat gain – Hot and cold spots make your HVAC system work harder than it has to. Once window film in installed, your air conditioning – and your bills – can get a much-needed break. UV protection – UV rays can fade your fabrics, furniture and flooring. Even worse, they put your family at risk of skin damage. Home window tint blocks 99.9% of UV rays to keep everything – and everyone – safer inside. Defends you against glare – Vista by LLumar window tint reduces annoying glare by 87% so your family can play on the computer and watch TV without eye fatigue. Enhanced privacy – Enjoy your outdoor views without feeling like you’re on display. With a variety of shades and opacities available, you can see out, but others can’t see in. Protection for your family – Residential window film holds broken windows in place, protecting you against flying shards of glass. Start enjoying a more comfortable home today! 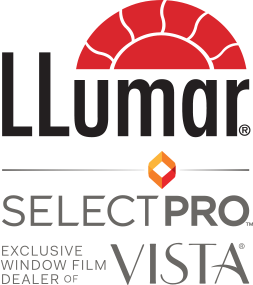 At one-fifth the cost of window replacement, Vista by LLumar residential window film is one of the smartest updates you can make to your home. Featuring neutral, warm gray hues and advanced technology, Vista™ Ceramic Film stealthily boosts comfort and protection from harmful UV rays. It’s an ideal choice when you love the look of your existing windows inside and out, but not the performance. The secret to this film’s success is nano-ceramic technology. This state-of-the-art manufacturing process applies a whisper-thin layer of ceramic to film, for solar control that’s completely metal-free. This delivers the lowest possible degree of visible reflectivity. If you like the benefits of reflective film but would rather see what’s outside your windows than a reflection of yourself, this film is for you. Our dual-reflective film technology pairs a mirrored exterior side with a more subtle interior side, providing superior solar control while maintaining outside views after dark. It’s also able to block 99% of the sun’s undesirable UV rays, keep you feeling cool, and block heat so your air conditioner runs less. Choose your favorite from a range of pleasant, homey hues. 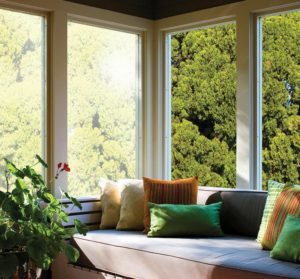 EnerLogic is our most state-of-the-art window film, integrating innovative solar control with unparalleled glass-insulating capacity. Installing it gives you almost the same results you’d get from a full window replacement that upgrades glazing with an extra pane of glass. Plus, EnerLogic doesn’t change the desirable way sunshine lights up a room. With EnerLogic’s patented form of low-e technology, you get superior comfort and energy savings in any season. This adds future value to your property, making it less expensive to heat and cool. And Payback for initial EnerLogic investment is surprisingly fast, too. Harmony is an advanced film designed to enhance home life, intelligently marrying sophisticated features with a look that’s extremely low in reflectivity. With a premium combination of proprietary metals and nano-ceramic technology, Harmony transforms your love-hate relationship with sunlight. Harmony helps make hot spots virtually disappear, soothes eyes with glare reduction, and eases concern about UV rays. Plus, every shade is soft, subtle and offers superior optical clarity. We recommend Harmony for coastal areas, historic homes, to meet neighborhood association guidelines, and for homeowners who don’t want a change in exterior style. Our neutral window films may be less reflective and less attention getting, but they pack a powerful punch when it comes to controlling the sun’s effects. After installation, rooms feel noticeably cooler, 99.9% of UV rays can’t harm you or your furnishings, and annoying TV glare is a thing of the past. Our scientists also say neutral window film provides “uniform light transmission without any strong color tone.” What you’ll say is that with neutral film, the sunlight streaming through your windows still looks lovely, clear and true. Dramatically improve the comfort level of your indoor living space while also making a dramatic outdoor style statement. This film has reflective technology on two sides to provide a high level of heat, glare and UV control that keeps you at ease in any room, at any time of day. Reflective technology also gives exterior windows a pleasingly uniform, contemporary look. A selection of silver, gold, bronze, blue and gray shades allows you to fine-tune for the perfect complement to your home’s masonry, siding, roof and landscaping. Interested in improving your home comfort and energy use, but not in broadcasting your choice to your neighbors? No problem, specialty solar films are designed especially for your situation. They’re a virtually invisible way to improve the performance of your home’s window glass, able to enhance indoor comfort while maintaining optically clear views. Whether you’re choosing specialty solar window film because of neighborhood rules or historic preservation, you’ll appreciate what it adds to your property. And what it doesn’t, too. Contact Distinctive Glass in the greater Indianapolis area today to see all of our stylish home window tint options. No matter what business you’re in, your main focus is your cash flow. And one of the biggest hits to your bottom line is a high energy bill due to inefficient windows in your facility. Reduce your energy costs by up to 15% while increasing your tenants’ comfort with Vista by LLumar LEED-certified commercial window tint from Distinctive Glass in the greater Indianapolis area. Ideal for retail stores, corporate offices, apartment buildings, and any other public facility, commercial window film offers business owners a payback within three years! Increased energy efficiency – Commercial window tint reduces solar heat gain by 75% so you drastically reduce uncomfortable hot and cold spots and depend less on your air conditioning. Protection against UV rays – Vista by LLumar window film blocks 99.9% of ultraviolet rays to defend your furniture, flooring and artwork against fading and discoloration. Enhanced building appearance – With a variety of shades and opacities available, window tinting complements the aesthetics of your building and creates a uniform look from every angle. Glare reduction – Vista by LLumar blocks 87% of glare so your employees can work on their computers while enjoying the natural light that enhances productivity. Safety for your facility – Virtually invisible, but highly durable, window film for businesses defends you against break-ins. It also holds broken windows in place to protect your tenants from flying glass. Whether you’re building a new facility or upgrading your current one, commercial window film is just smart business! With its superior cost savings and chic style, it’s no wonder architects, interior designers and property managers from across the greater Indianapolis area continue to depend on Vista by LLumar. Our dual-reflective film technology pairs a reflective outside-facing layer with a subtler inside-facing layer. This enables it to provide significant solar control while maintaining outside views after dark. It’s also able to block 99% of the sun’s undesirable UV rays, keep all areas feeling cool, and save energy by stabilizing temperatures so building systems run less. Choose the right match for your building from a range of sophisticated shades. Our neutral window films may be less reflective and less attention getting, but they pack a powerful punch when it comes to controlling the sun’s effects. After installation, even areas next to large windows feel noticeably cooler. Plus, 99% of UV rays can’t harm people or furnishings, and annoying glare won’t interfere with comfort or productivity.Technically speaking, neutral window film provides “uniform light transmission without any strong color tone.” What this really means, though, is that neutral film doesn’t interfere with the lovely way sunshine lights up a space. Architects, designers, building managers and owners – please thank us for this solution by choosing it for your next “problem” project. Interested in improving your property’s comfort and energy use, but not in broadcasting your choice to future clients or tenants? No problem, specialty solar films are designed especially for your situation. They’re a virtually invisible way to improve the performance of your building’s window glass, able to enhance indoor comfort while maintaining optically clear views.Whether you’re choosing specialty solar window film because of business concerns, neighborhood rules or historic preservation, you’ll appreciate what it adds to your property. And what it doesn’t, too. The secret to this film’s success is nano-ceramic technology. This state-of-the-art manufacturing process applies a whisper-thin layer of ceramic to film, for solar control that’s completely metal-free. This delivers our lowest visible reflectivity offering, plus the strength to resist salt corrosion in coastal areas. To get your free commercial window tint estimate, contact Distinctive Glass today! Stop cranking your fuel-burning air conditioning and instead sit back and relax in cool, consistent comfort with LLumar automotive window tint. When professionally installed by Distinctive Glass in the greater Mooresville area, window film reduces solar gain to lower temperatures by 65% while offering the eye-catching style every driver desires. With LLumar automotive window tint from Distinctive Glass, you can look cool and feel cooler every time you hit the road. Schedule your appointment in the greater Mooresville area to see all of your shade options, specially manufactured to complement your factory-installed glass. Do you imagine yourself gliding down the road like a spy, disguised by sophisticated cover? Rolling like a rock star, bass thumping in dramatic darkness? Or do you simply want a charcoal to match your factory privacy glass? With our dyed window tints, you’re free to dream up a look that will transform your car from ordinary to envy inspiring. Our dyed window tints are definitely high on style. Still, they’re a smart buy that’s worthy of your auto investment. Every shade can turn heads, resist scratches, reduce annoying glare, and block 99% of ultraviolet rays. Our dyed window tint is a mixture of polyethylene, UV blockers and premium dye that’s extruded into a micro-thin sheet, then coated with a second UV blocker and adhesive. Other tints films have dye applied only to the surface, making them less durable and likely to discolor. Everyone enjoys a little friendly sunshine at the park, but on the road it becomes overbearing and harsh. Fortunately, that problem is easily fixed with our metallized window tints. They have a fantastic look, plus added protection against the sun’s most unwelcome side effects: untouchably hot surfaces, damage from extended exposure, and AC that just can’t keep up. You’ll appreciate the variety of charcoal shades as much as the sun-taming technology of our metallized tints. They’re a micro-thin layer of advanced technology that’s a major upgrade in style and comfort. 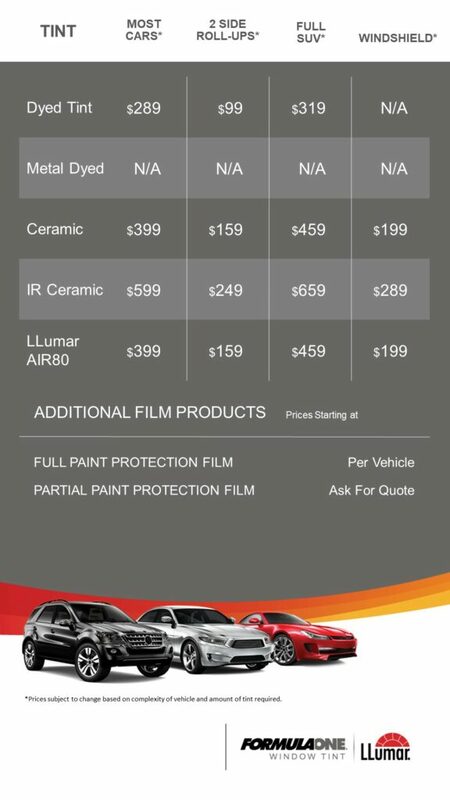 Our auto tints start with components like color-stable dye and powerful adhesive. We manufacture to the strictest standards, too, doubling up on UV protection and even adding an extra layer for best-in-class scratch resistance. Drive in style, revel in comfort and connect with ease, thanks to all the features loaded into our ultra premium ceramic window tints. They’re available in a generous range of sophisticated charcoal shades, so you can create precisely the look you want. Plus, every one of this luxurious tint’s stylish shades is paired with nano-ceramic technology. This manufacturing innovation makes it possible to deliver superior heat rejection, glare control and UV protection that’s completely metal-free, so it won’t interfere with signals from your electronic devices. If you’re demanding and want your car to get noticed, you’ve found your match in ceramic auto tints. Our auto tints start with components like color-stable dye and powerful adhesive. We manufacture to the strictest standards, too, adding a ceramic nanoparticle layer for superior heat rejection and doubling up on UV protection, plus including an extra layer for best-in-class scratch resistance. Contact the car window film experts at Distinctive Glass today for your free, no-obligation estimate! Whether you need residential, commercial or car window film, LLumar window tint and Distinctive Glass offer significant benefits for homeowners, business owners and drivers alike in the greater Indianapolis area. LLumar solar control film helps reduce energy costs by up to 15% year-round, even during the hottest summer and coldest winter months. Stop the hot and cold spots that make you uncomfortable. Window tint helps maintain consistent temperatures in every room. Window film blocks 99% of UV rays to help reduce fading of your furniture and flooring and to protect you against dangerous skin damage. By stopping 87% of irritating glare, LLumar window tint lets you drive, work and watch TV without distraction from the sun. LLumar window film costs one-fifth the price of expensive window replacement, but offers many of the same benefits. LET DISTINCTIVE GLASS HELP WITH YOUR SOLAR HEAT AND UV CONCERNS TODAY! Get your free residential, commercial or automotive window film quote from Distinctive Glass and start enjoying greater comfort, cost savings and glare protection. As your LLumar window tinting dealer for the greater Indianapolis area, we can help you take control of the sun with a solar film solution that fits your needs, budget and design. Plus, with our 100% satisfaction guarantee, that peace of mind will last for years to come! Serving the greater Indianapolis market. Weekend and after hours available. Automotive installation by appointment only.